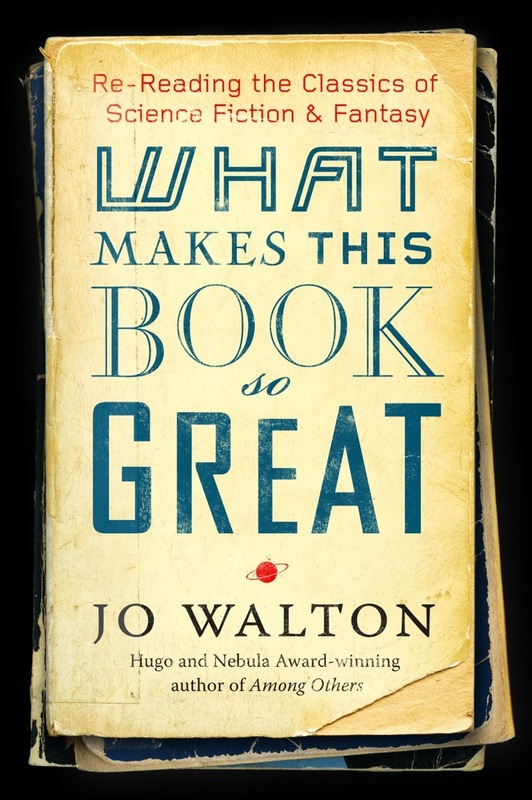 What Makes This Book So Great: Re-Reading the Classics of Science Fiction & Fantasy by Jo Walton is the last book I read before DWJ March and I'm actually writing this post on February 28th because I don't want to miss sharing any of what I've gained from reading this book. I have yet to get to any of the Jo Walton books that have made it onto my TBR but it doesn't matter (and I don't think she would mind so much either). She's an avid re-reader and so am I and so I'm sure that we could be friends. While this book is subtitled "science fiction and fantasy", it's really mostly science fiction and, in addition, it's really mostly older science fiction so I haven't read many of the books that she is talking about. In fact, I counted and there were only maybe seven books that she mentions that I have read. But again, this didn't matter at all because she's not reviewing the books and she's not assuming that you've read them before either. Instead, she takes each of the 100+ books that she's just re-read and she briefly gives a synopsis of sorts and then talks about the experience of re-reading each one and tells which are the things that bring her back to these tales time and time again. There are also a few posts (these were all originally posts on Tor.com) just about reading and those will be easy to relate to by any of us readers. "A re-read is more leisurely than a first read. I know the plot, after all, I know what happens. I may still cry (embarassingly, on the train) when re-reading, but I won't be surprised. Because I know what's coming, because I'm familiar with the characters and the world of the story, I have more time to pay attention to them. I can immerse myself in details and connections I rushed past the first time and delight in how they are put together. I can relax into the book. I can trust it completely. I really like that." Finally, the last entry of this book also got me thinking about this blog. Since her original writings were in blog form, I really feel like there is a similarity in purpose and style and the way that she unapologetically states that she is not a critic but rather a fan really resonated with me and gave me the confidence to keep pushing my blog in the direction I've chosen to take it. To dedicate a month to a favorite author is perfectly acceptable because I'm celebrating reading and re-reading and the books that I love. "You may also have noticed a lack of critical detachment. I am talking about books because I love books. I'm not standing on a mountain peak holding them at arm's length and issuing Olympian pronouncements about them. I'm reading them in the bath and shouting with excitement because I have noticed something that is really really cool." I highly recommend this book to anyone with even a passing interest in SciFi/Fantasy and especially those of you who are re-readers. Also, her posts are still going up on Tor.com so you can read them there (plus many, many more). I have a feeling that I will go down that rabbit hole soon and come out a better and more confident genre reader (and, of course, re-reader) in the end. Darn you, you've just extended my TBRs by, like, a skyscraper pile of books! I hadn't heard of Jo Walton. I love her blogs, and I want to read everything she recommends, because she makes it sound so good! And I want to read her books because I like her writing so much. I had this book out of the library and had to give it back before I'd gotten any way into it. I'm so sad, because it's such a good book. I know I will buy it when it's out in soft cover. It's got so many interesting books and thoughts on them. Best of all, you can come back to this book after reading the books and see if you agree with her! At least I found that to be true. Because of her post on The Wood Wife by Terri Windling, I was so interested I ran to my shelves (I'd been trying to read the book for a while now) and read the book right away and loved it. A very good resource book for fantasy and sf readers, especially sf. I plan on buying it too -- and pulling out a very large stack of post-it notes! This seems like the perfect book to read IN a library, so you could take a break from it and wander around to find all of the books she talks about. I think if I had it at home I'd go nuts not being able to sample all the old sci-fi. Yes. It was tough to read at home without the other books all around but I told myself that this was just my first reading to get acquainted with many of the titles and authors that I didn't know. The next time will be full of notes and books. I've been wanting to read this since I first heard of it! I'm so glad you enjoyed it! It gives me hope I will too! The nice thing is that she's a good writer so even if you aren't completely into the type of book she is writing about, it's still entertaining and manages to make you think about things that you can apply to other books. I think you'll enjoy it too! It's exactly what she writes about. It's not the technical merits of a book, just the visceral reader reaction. It's great!